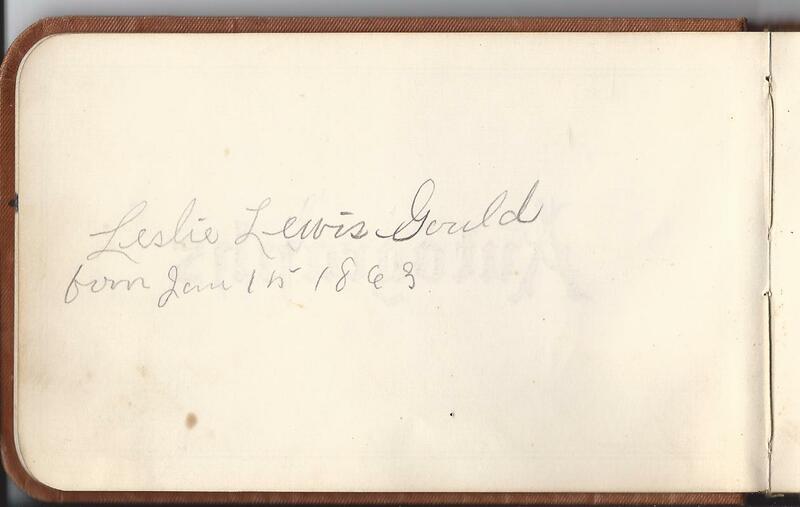 According to an inscription on the first page with handwriting, Leslie Lewis Gould was born 15 January, 1863. Online research reveals his place of birth as Hartland, Maine, in Somerset County. Leslie was the son of Lewis Augustus Gould and Judith (Packard) Gould, born in Sangerville, Maine, and Mount Vernon, Maine, respectively. His paternal grandparents were Samuel and Lydia (Hilton) Gould. His maternal grandparents were Bethuel and Elizabeth (Maxfield) Packard. On 29 November 1888 at Corinna, Maine, Leslie Lewis Gould married Mary Kemp Maddocks. Mary was born 19 June 1870 at Dixmont, Maine, the daughter of Henry Monroe Maddocks and Frances Lucinda (Sewell) Maddocks, both born at Dixmont, Maine. I also saw Mary's mother's name as Lucinda Frances Sewell. Mary's paternal grandparents were John Willie Maddocks and Mary Kemp (Gould) Maddocks. Her maternal grandparents were Silas and Almira (Stevens) Sewell. 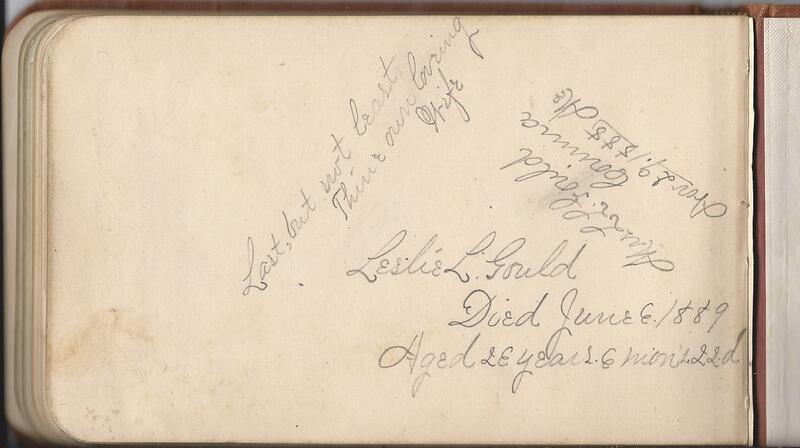 Sadly, as the below image reveals, Leslie Lewis Gould died shortly after his marriage to Mary. 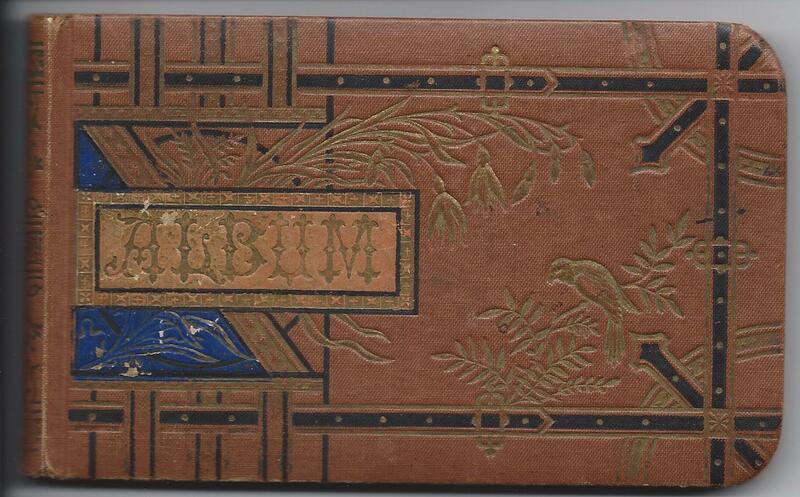 She wrote the date on the last page of the autograph book: 6 June 1889. 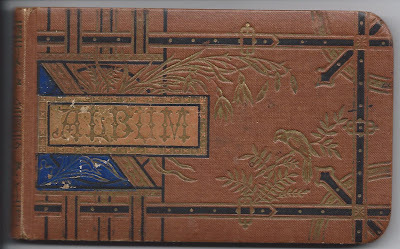 On 29 June 1891 at Corinna, Maine, Mary Kemp (Maddocks) Gould married farmer Joseph Henry Worthen. He was born 6 May 1839 at Corinna, Maine, the son of Deacon Joseph and Eliza A. (Gilman) Worthen. His paternal grandparents were Moses and Bethiar (Meacham) Worthen. His maternal grandparents were John Taylor Gilman and Susan D. (Gilman) Gilman. Joseph had two children with his first wife, Amanda Copp, who died in 1888. He and Mary had four more children. 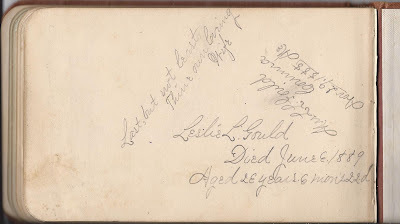 If you have knowledge of the Leslie Lewis Gould and Mary Kemp Maddocks families, or any of the signers of the autograph book pages, please leave a comment or contact me directly. I am Suzanne (Maddocks) Gagnon. 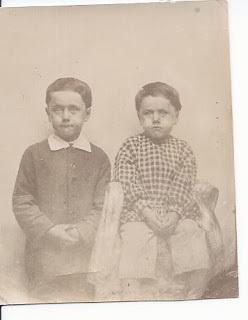 I am looking for my 3x great grandfather's parents. He was Jacob G. Maddocks, married to Elizabeth Linscott in Appleton Maine, 1844. Jacob was born in 1825, presumably in Maine. I have a Maddocks family tree that is over 4' high and 5' wide. Mary Kemp Gould married John willie Maddocks in 1822. He was born in 1799, son of John Alley Maddocks & Elizabeth Kennedy. Henry Monroe was a twin to Henrietta. They had a set of twin siblings, James Augustas and Jane Augusta Maddocks. They had several additional siblings. How did you come to have to book? Are you a family member? Thanks for commenting and providing this information. I notice that some online trees have additional children for them that are actually the offspring of another couple. 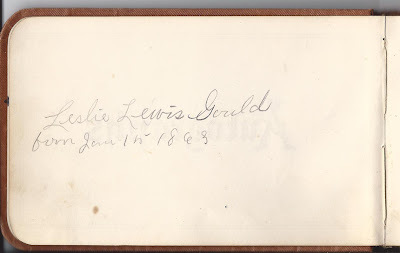 This is not my family, but at some point I acquired the autograph album of Leslie Lewis Gould, either at an antique shop or on eBay. Did you know that you can set up an alert with eBay to send you a notice if someone lists something with the search words you have specified? Same with Google. Good luck with your family research!